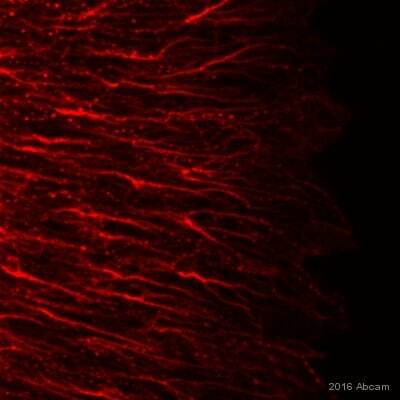 Rabbit polyclonal Detyrosinated alpha Tubulin antibody. 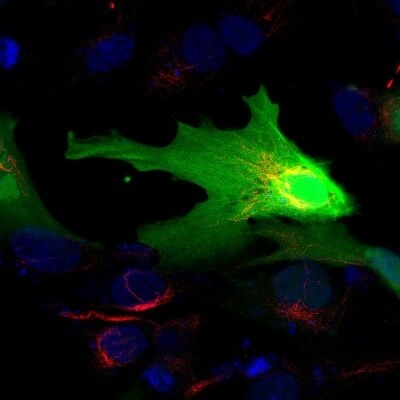 Validated in WB, IHC, ICC/IF and tested in Mouse, Human. Cited in 31 publication(s). Independently reviewed in 7 review(s). A 10 residue synthetic peptide of the C terminal domain of human alpha Tubulin. We are constantly working hard to ensure we provide our customers with best in class antibodies. As a result, we are pleased to offer this antibody in a purified format as of 10/11/2017. The following lots are still unpurified and still in stock as of 10/11/2017- GR315444-5, GR315444-3 GR285350-3, GR3181389-3, GR3181389-4, GR3181389-5, GR3181389-6, GR3181389-7. Lot numbers other than GR315444-5, GR315444-3 GR285350-3, GR3181389-3, GR3181389-4, GR3181389-5, GR3181389-6, GR3181389-7 will be purified. Please note that the dilutions may need to be adjusted accordingly. Purified antibodies have the advantage of being enriched for the fraction of immunoglobulin that specifically reacts with the target antigen and for having a reduction of serum proteins. Our Abpromise guarantee covers the use of ab48389 in the following tested applications. WB 1/500 - 1/2000. Detects a band of approximately 51 kDa (predicted molecular weight: 50 kDa).Can be blocked with Human Detyrosinated alpha Tubulin peptide (ab191559). 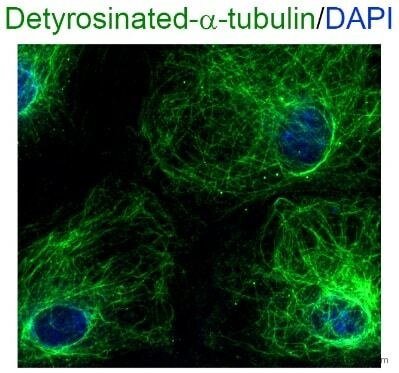 Microtubules are required for many well characterized functions in eukaryotic cells, including the movement of chromosomes in mitosis and meiosis, intracellular transport, establishment and maintenance of cellular morphology, cell growth, cell migration and morphogenesis in multicellular organisms. The building block of a microtubule is the tubulin subunit, a heterodimer of alpha and beta tubulin. Both of these monomers are found in all eukaryotes, and their sequences are highly conserved. The tubulin protein is a major target of drug molecules, and consequently, tubulin inhibitors have attracted great attention as antimitotic antitumor agents for chemotherapeutic use. 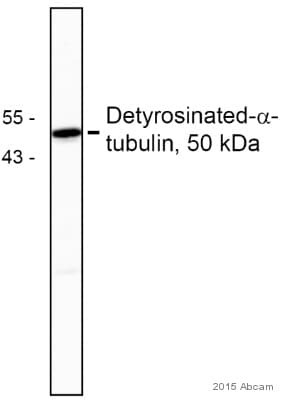 This antibody recognizes detyrosinated alpha tubulin, a post translational modification of alpha tubulin. Additional bands at: 28 kDa, 44 kDa. We are unsure as to the identity of these extra bands. Detyrosinated alpha Tubulin contains a number of potential phosphorylation sites (SwissProt) which may explain the migration pattern observed. Publishing research using ab48389? Please let us know so that we can cite the reference in this datasheet. I would like to directly label your a b48389 but need the AB concentration in µg/µl or mg/ml for this. Could you kindly provide me with this information as the data sheet does not indicate this information. Thank you for your enquiry regarding ab48389. Generally, we can give you a range of concentration for serum: 1-15 mg/ml. Thank you for confirming these details and for your cooperation. Your enquiry has been forwarded to me as my colleague Cathrin is currently away from the office. The details provided enable us to closely monitor the quality of our products. I am sorry this antibody did not perform as stated on the datasheet and for the inconvenience this has caused. As requested, I have issued a free of charge replacement with the order number 1221193. Therefore, I would like to ask you kindly if you could send me a new Ab. 1. My previous order No. 3869020, on the 4th of October 2012. 3. I used same samples in addition to freshly prepared samples. I am sorry to hear the suggestions made have not improved the results on this occasion. I appreciate the time you have spent on these experiments and would be pleased to arrange a free of charge replacement or credit note in compensation.